Friends came to dinner last week, just back from a trip to Mexico, still immersed in its warmth and colour. They brought us several treats, and after opening the goodies, talk turned to how gift customs have changed. When I was a kid, the return of a world traveler hauling a bulging suitcase was an event. In 1957, when my sister Jane made a grand tour of Europe after college graduation, she brought me a Swiss dirndl embroidered with edelweiss. (I should be clear, I was eight.) Mom and Dad received a Liberty scarf and Viyella shirt; there were souvenirs from the Vatican, a straw hat from Capri. Such wonders were absolutely unattainable in our small town, and even most American cities. Jonathan recounted how when he was a child, relatives from the Mideast would visit his New Hampshire home and spread gifts over the the floor. They would invite each family member to choose, as well as give specific gifts to each person. But globalization has invaded the souk; nearly everything that spilled out of Jane's trunk could now be bought online or in a local shop. A Toronto shopkeeper I knew kept a stack of pretty French tea towels, a classic travel gift, in stock. She sold them to people who'd returned from Paris short a gift or two. Still, some travelers seek out the handmade and local, tuck these unique items into a suitcase and share them, along with stories and photos. In the past two months, I've received three such gifts from friends. Ronni took a business trip to India and once there was bitten by the textiles bug. Always a quick study, she made an intuitive choice on the spot, and surprised me with this luminous wool shawl of red and bronze. Christine and another teacher friend accompanied a group of teenaged volunteers to help build a school in Kenya, working though intense heat, then enjoying the respite of a safari. The cheerful handmade ceramic rhino she brought back now holds my perfume samples. When Beth visited a craft market, she thought these glowing, opalescent glass earrings spoke of me. Si, si! Each gift was a surprise and such fun to open! Unwrapping it, the brand-worshiping world receded, the hand of a far-away artisan touched mine. Like a handwritten letter, there is an old-time air to the travel gift, an element of romance. We can shop a site like Novica, and that's a boon to both buyer and seller, but when a friend pauses before beauty in a distant place and thinks of you: priceless. An old friend from Paris, who is very much the world traveller, visited me recently. However he is also an author, so of course his gifts were books. I used to bring back little Duralex glasses, but they are available in Montréal now. Another good, cheap gift is a set of gants de toilette - so much nicer than facecloths. How I love that shawl! The shawl is beautiful and what a good idea to put your perfume samples in the pottery piece. Le monsieur still tries to bring gifts back for about a dozen people every time we travel. Mustards from the Maille boutique, glass jewelry from Venice, scarves have all been favorites. We usually go through Heathrow, so during layovers do a sweep for Cadbury treats that aren't available here for anyone we might have forgotten. Your gifts are lovely, especially those earrings! What gorgeous gifts - your friends have excellent taste! But of course, they are YOUR friends, so we know they can spot beauty and quality. I too prefer an artisan made gift, although it can be surprisingly tricky to determine where a piece is made. On a recent trip to South Africa, I found gifts of jewellery and scarves that were African-made but perhaps in another country. The best gift a collection of shells and rocks found on the journey for my young nephew. That shawl is gorgeous and so warming, a lovely colour for this hesitant spring. 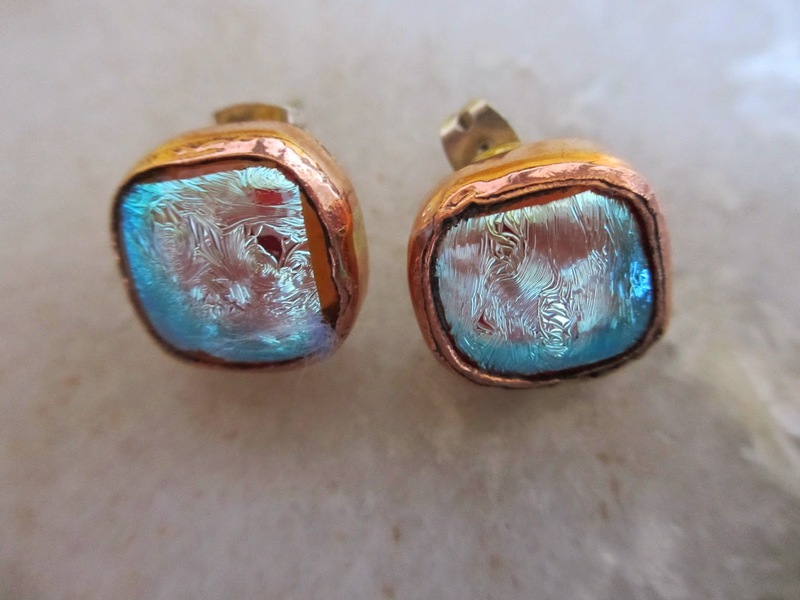 And those earrings are the prefect spring combination of icy sparkly blue and sunny gold. You're lucky to have such thoughtful friends. Your friends are great with gifts. I love everything. My daughter got us all handknit slipper socks in Serbia. We love them. It does seem that many things from Europe are now available in the US and Canada--and at about the same prices. What a great subject, as usual. We just returned home from a 3 week trip to China and bought almost nothing. 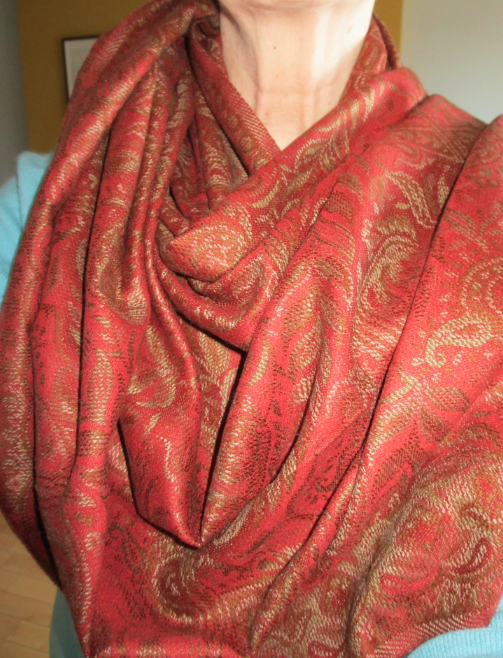 I purchased an inexpensive silk scarf ($10) and 2 small ceramic bowls, all of unknown origin. My partner purchased 3 shirts, made in China, complete with designer labels. Friends and family claim not to want more "stuff" so we don't shop for them any more. We spoke to many North American travellers during our trip and most indicated that they no longer shopped on their vacations. It used to be fun poking through market stalls and little shops. On the bright side, now we can travel with much smaller suitcases. We have a shop here Ten Thousand Villages which stocks handmade items from across the globe. It is a treasure trove and one needn't travel far to get a taste of the culture for a minimal expense. But nothing compares to actually doing business with the merchant in person in their own country. You and Le Duc are thoughtful yourselves, and deserve thoughtful gifts! I really enjoyed looking with you in mind and only wish I'd bought a few more things - guess I was expecting that extra day! I love that shawl, too. What beautiful gifts (particularly the shawl). I think there is still a cache about gifts bought while travelling. I tend to try to buy things for my sister in law as she lives in London and is fairly well paid - there's nothing we can buy that she wouldn't be able to buy herself unless it's from a country she hasn't visited. I also really treasure the things I buy myself while travelling for the memories they evoke. lagatta: Books are a wonderful gift and there are so many small presses we cannot get here, even by online means. Mme: Otherwise I stick them in a drawer and forget them! unefemme: I used to do a lot more of such shopping and still on occasion see something for someone. Much more fun when not expected. Janice: Each has "the eye"- and are kind enough to share their discoveries. LauraH: And some pieces are made far, far from where sold! frugal: That is why I largely stopped doing it, but my pleasure has led me to go back to travel gifts. Anon@11:54: For me, it is a way to connect with people and the culture, even if I do not buy a lot. In China I too would want to look at silk... and so easy to carry back. hostess: We have a Ten thousand Villages here, too. Lots of appealing things. Eleanorjane: Yes, there is that cachet. I bought tiny enameled Kashmiri pillboxes when in India, for several friends, a cashmere scarf for another. Even if I saw them in a shop here, I can still taste the tea I was offered as I slowly made my selection, and smell the attar. That is part of the charm. I love sometimes buying something that catches my eye and speaks either to me directly or reminds me of a particular person. Then that combination of the place and person seems important and I might buy a gift (for myself or others) too often I've given up the "expected" gifts. There is too much in the world I come from. What I love about the treasures you post each that they each seem to capture that sense of having been specially and thoughtfully chosen. And that is a true treasure. You are fortunate to have such thoughtful friends. And their gifts are very "you." I tend not to buy "big" gifts for people when I'm traveling -- though I do like to bring special food and spices. And it was great fun to buy charms around the world for my eldest niece and god-daughter to put on their charm bracelets. And when I'm in the States, I buy things that you'd hardly see as gifts unless they were impossible to get where you are. I made some Spanish friends very happy indeed with big boxes of Spike seasoning and a roll of Velcro cord wraps. I have a scarf from Paris that you gave me which I cherish for its perfect reflection of me in you. So generous you are.